Home › News › Non-NorthWest events on 3rd Jan: a chance to warm up for the nationals. Non-NorthWest events on 3rd Jan: a chance to warm up for the nationals. A couple of events we’ve been asked to spread the word about, both taking place on 3rd January – one week before the nationals in Birmingham. 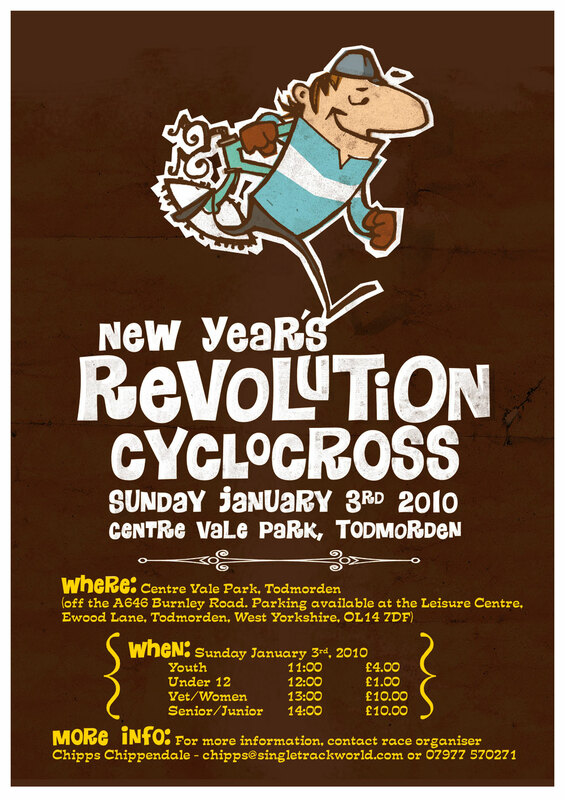 Just over the border from Lancashire is the second running of the New Year’s Revolution ‘cross, put together by MTB guru Chipps Chippendale. All the detailsare int he poster (right); point your satnavs to OL14 7DFand put on a small gear for the legendary cobbled climb that makes the Muur van Geraardsbergen look like a bump up a kerb. 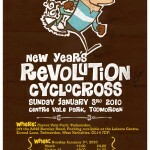 Hambleton Road Club are promoting the 5th round of the CXNE league (Cyclo Cross North East) on Sunday 3rd January 2010 at Croft Motor Racing Circuit near Darlington . The race offers an exiting opportunity to ride at this popular motor sport venue and is open to riders of all abilities, so if you fancy burning off a few of those excess Christmas Calories, or are a seasoned Cyclo Cross rider fighting for League positions then this is the race for you! The fast, flowing nature of the course will also allow Elite riders to fine tune their preparations for the national championships, held in Birmingham the following weekend. The races start at 10-30am for the Under 12s, 11-00am for Youth riders with the Senior/Vets/Ladies/Juniors race taking place at 12-30pm. All races are electronically timed, producing immediate results that show finishing position, overall time and individual lap times. The modern facilities at Croft Circuit allow for ample parking, indoor signing on and changing facilities. The race is spectator friendly with refreshments being served from 09-30am onwards. Toilets for riders and spectators will be open throughout the day. Hambleton Road Club on Face Book.